Observe how carefully this 22-month old child is trying to string beads together. Of all our many responsibilities towards children in school, perhaps the greatest one is to develop and protect their sense of concentration. Very often, this is achieved by controlling our adult urge to interfere in their work, and allowing them to correct their own mistakes. While this is easy to say, it is very hard to do even for trained and experienced Montessori teachers. We have to keep reminding ourselves that struggle is good, that the young child learns best when struggle leads to discovery. "I suggested to some teachers that they should wear a belt with beads attached. Then every time they have an impulse to interfere, they would draw a bead along. This is very useful, because when we have an impulse, we must act, and the reaction with the bead is a help. From day to day, one would make observations upon oneself in this way until one came to the point of not having to draw any more beads. We should then find that we had acquired a great calm and sense of repose. Perhaps we should have become transformed within. At any rate, we should have learnt the following: that almost all these impulses to action are unnecessary." Maria Montessori famously said, “What the hand does, the mind remembers”. The hand reports to the brain; the brain guides the hand; the cycle continues, resulting in the development of the intellect. Thus, while learning to write, it is important to not jump too quickly into pen-paper work before building and refining the child’s muscle memory using their hands. The “sandpaper” letters give the child a concrete, tactile experience that helps imprint alphabet patterns in the brain. 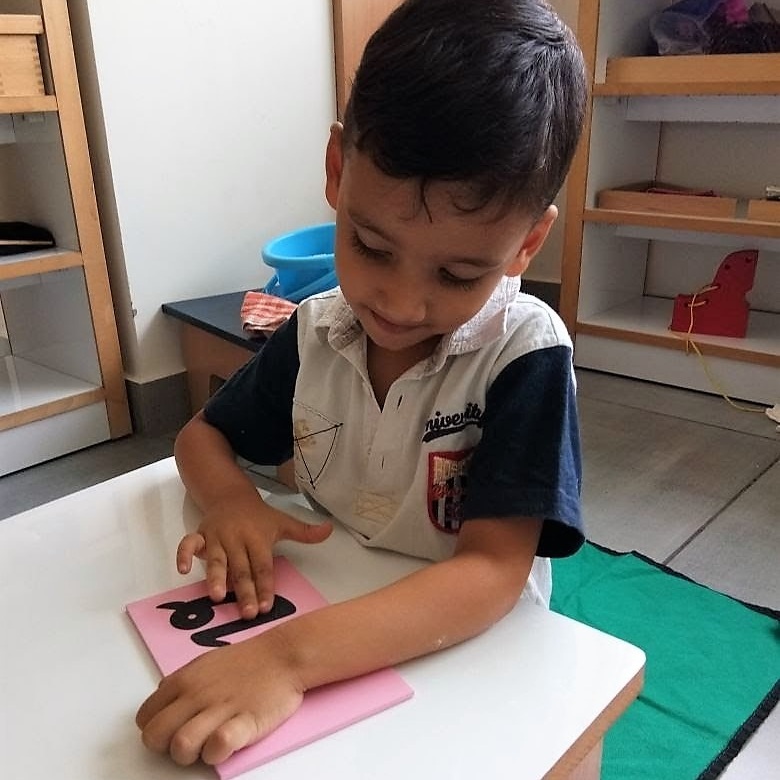 In this case, this child is working towards mastering his understanding the letter “v” by tracing the corresponding sandpaper letter. This is critically important preparation before the child physically engages in writing the letter on paper or slates (and the coarse sandpaper is very enjoyable to run their fingers through!). The first Russian nested doll ("matryoshka") set was carved in 1890 by a couple of Russian craftsmen; today they can be found across the world, including in Montessori environments. 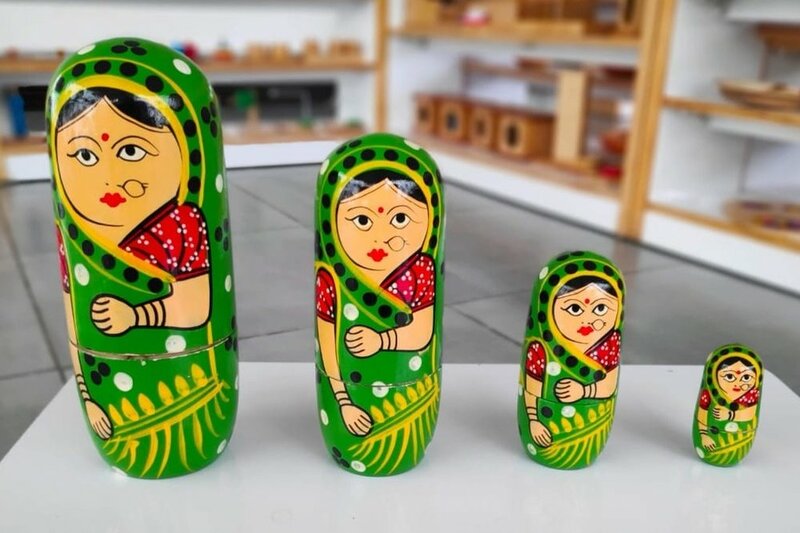 We love our Indian version of the original Russian matryoshka dolls! What do these dolls have to do with Montessori, you ask? Initially, young children love the surprise of opening these beautiful dolls to find another inside. Soon they begin working to undo and put together the dolls in the right order. Nesting materials like these dolls help children understand spatial relationships, develop fine-motor co-ordination, build the language of comparison (big, bigger, small, smaller), as well as prepositions (inside, outside, under). These dolls also give children the opportunity to concretely experience the concept of a whole object that contains individual parts that are nestled within. Some Montessori activities are genuinely complex, and can be very confusing for adults unaccustomed to our approach. However, some other Montessori activities are very simple to understand, but can breed endless complexity with little tweaks. One of our favourite introductory practical life exercises is the lock-and-key set: this is a simple set of locks and keys, with children trying to match the correct pairs. Based on the child's level, the set can contain a variety of differently sized locks, or a larger number of pairs. It is not unusual for us to see children younger than 3 working on solving this puzzle for an extended duration of time without asking for any help. 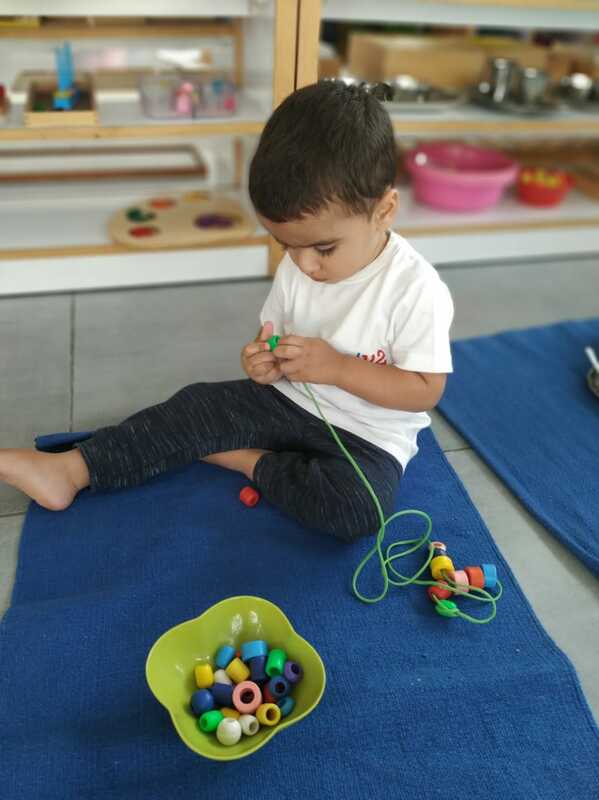 It is indeed a wonderful activity for developing fine motor skills and problem-solving abilities, and very easy to replicate at home!